John was appointed to the Common Council in January to fill the vacancy caused by the election of David Buchwald to the New York State Assembly. A resident of our city since 1974, John is a city planner and attorney. He practices land use and environmental law at his offices in downtown White Plains. John has lived in three different White Plains neighborhoods: Carhart, Fisher Hill, and Gedney Farms and has been active in their neighborhood associations. 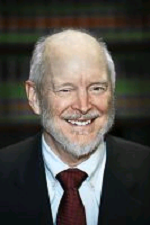 He participated in writing all versions of the White Plains Comprehensive Plan adopted since the late 70’s and was a consultant to the city on the comprehensive revisions to the Zoning Ordinance adopted in 1982. John knows our city. His three kids are proud graduates of White Plains public schools, attending from elementary through high school. John’s wife Susan is a former member of the School Board. Continuously active in the civic life of our city, John has served with the Sustainability and Environmental Enhancements Committee, Cub Scouts, White Plains Beautification Foundation, Rotary, Downtown Business Improvement District, and the Friendly Gathering.